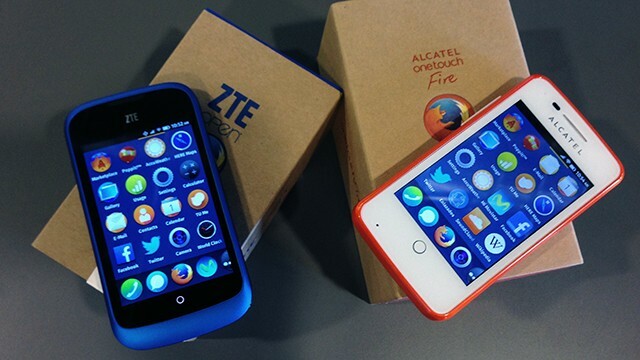 The two phones running the new Firefox mobile operating system, the ZTE Open and Alcatel One Touch. 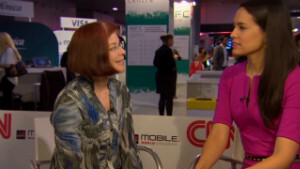 (Heather Kelly @ CNN) -- A new smartphone operating system is joining the fray. Mozilla released a phone running its new Firefox OS in Spain on Monday, joining leading mobile operating systems Android and iOS, as well as smaller players Windows Phone and Blackberry. The ZTE Open and Alcatel OneTouch Fire are very basic phones with 3.5-inch screens, entry-level specs and appealingly low price tags. Telefonica will sell the ZTE Open in Spain starting July 2 for 69 euros, or about $90. Nonprofit company Mozilla is trying to shake up the typical closed app ecosystems with the Firefox OS. Built using open Web standards, it will appeal to the estimated 8 million Web developers who can jump right in and start creating HTML 5 apps for the phones. There is no timeline for when the phone will come to the United States. For now, Mozilla is focusing on emerging markets such as Spain, Poland, Colombia, Venezuela and eventually Brazil, where an iPhone is prohibitively expensive for most people. "For many of the users, this will be the first smartphone they would purchase," said Chris Lee, who heads the product team for Firefox OS. Firefox OS is rolling out in locations where significant portions of the population are still using feature phones. Multiyear service contracts that can cut the cost of a smartphone aren't as common, and expensive high-end handsets such as the iPhone or Galaxy S-series are out of reach. Cheap Android devices are available, but at an event in San Francisco announcing the release, Mozilla CTO Brendan Eich pointed out that most of those are running Gingerbread, an old version of the Android OS. Eich also said the company was realistic about its goals. "We are not aiming high and crashing into fortress Apple and fortress Google," said Eich. Design-wise, the Firefox OS keeps it incredibly simple and intuitive to appeal to new smartphone users. The current home screen is most similar to the iPhone, with a four-by-four grid of icons and a dock for the most-used apps along the bottom of the screen. Lee says this version is just a starting point. The company hopes developers will create custom interfaces for the devices that mimic what people love about Android or Windows Phone or even entirely new takes on the usual smartphone screens. Firefox OS already has a few of the most popular apps, including Twitter and Facebook, as well as a maps app powered by Nokia Here. The usual built-in phone features are included for making phone calls, texting and browsing the Web. New HTML 5 apps will be available in the Mozilla Marketplace after they're screened for security, though Mozilla won't be kicking apps out for content. The first Firefox OS phones are practical, not flashy, but the company hopes the combination of low price and open ecosystem will make it a moderate hit. "Consumers don't really know or care too much about what's under the hood," said Eich. "They want something that has a brand they trust ... a good price and something that satisfies them about the apps. That's a pretty short checklist." There are no immediate plans to bring the phones to the U.S.